Munin is a great resource monitoring tool. However, it can easily max out the server resource depending on number of monitored devices. I’ve ran into some disk I/O contention issue on my Munin server. I don’t even have that many monitored devices… only eighteen. There are couple ways to speed up Munin. With the combination of both greatly reduces server load… especially disk I/O. rrdcached will queue RRD changes and flush changes periodically controlled by cron job. This prevents lots of small random writes to disks. munin-async basically process munin-node data on client itself instead of on server. Server connects to the client and fetch data. Install rrdcached on Debian 9. The easiest way is run rrdcached is as the munin user. This requires no files/folders permission modification for existing Munin data. For my use I only utilize rrdcached for Munin use so this is how I set it up. Edit /etc/default/rrdcached and make it look like following. # -w: Data written every 20mins. -z Set random delay in data write up to 15mins. -f garbage collection every 30mins. BASE_OPTIONS="-B -w 1200 -z 900 -f 1800"
Edit /usr/bin/munin-cron and comment out following two lines. Create a new /usr/bin/munin-graph file with following content. Make sure it’s executable. Edit /etc/cron.d/munin and make it look like following. Comment out the original munin-cron line. 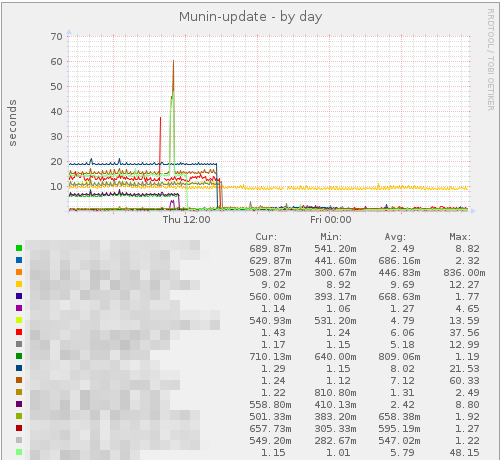 Set the nice priority on Munin updates and graphs. Restart rrdcached and check /var/run/rrdcached.sock file. This socket file should have group munin and not root. Ensure rrdcached_socket in /etc/munin/munin.conf point to correct rrdcached sock file. Install munin-async on Munin client (Debian 9). Once installed data in /var/lib/munin-async/ will start to populate. munin-async communicates over SSH so we’ll need to generate SSH keys for user “munin” on the server and paste into ~munin-async/.ssh/authorized_keys on the client. Change the default shell /bin/false for munin user on server to /bin/bash. su into munin user and generate SSH keys. Now copy content of server’s ~munin/.ssh/id_rsa.pub file and paste into ~munin-async/.ssh/authorized_keys on the client. Prefix the line before “ssh-rsa” so looks something like following. The prefix sets security on SSH logins that only allows running that munin-async command. While you are still su-ed as the munin user on server you want to SSH to the client at least once, accept the initial connection handshake, and make sure you can get in password-less. You should see some output like following when you do this. Now modify client part your /etc/munin/munin.conf file on server to read something like following. The disk I/O latency drastically improved. The amount of time takes for munin to update on server is almost instant.